The Guardian has now published their list of the top 25 comedy films ever, and, as a certain American would say, 'you CANNOT be serious!' (wait- that belongs in the sporting movies section really). What might have started as a little joke in the editorial office ('let's see how much we can upset our readers...') has finished, it seems, with an overblown, overstated and (let's face it) jaw-droppingly incompetent list. I'm all for the notion of re-assessing and re-evaluating (after all, Citizen Kane isn't the best film ever- and continually saying it is has become tedium personified). However, a list of COMEDY films (key factor- that they are funny) that includes NO Buster Keaton, NO Harold Lloyd, NO Laurel and Hardy and only one Chaplin and one Marx Brothers film yet manages to find room for the appalling Clueless and include Team America is no joke whatsoever. Given this current debate about comedy films and/or the travesty of the aforementioned newspaper's poll, it seems apposite to feature three new comedy releases from Odeon Entertainment which, although not mentioned in the 'top 25' list, are still perfectly good pieces of entertainment in their own right. The Mad Miss Manton (1938)- starring Barbara Stanwyck and Henry Fonda. 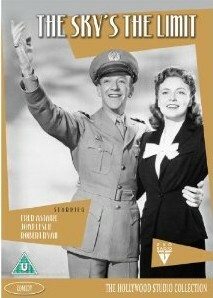 The Sky's The Limit (1943)- starring Fred Astaire, Joan Leslie and the perenially underrated Robert Ryan. 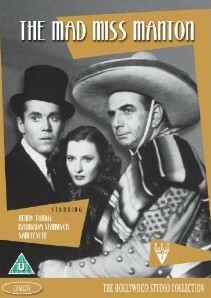 Stage Door (1937)- starring Katharine Hepburn, Ginger Rogers and Adolphe Menjou. The print quality of each film is excellent, with monochrome hues sharp and devoid of distracting damage. Most importantly, these titles look to have been mastered from the original source materials (as opposed to some budget releases which are clearly mastered from 16mm prints of the films concerned, meaning a lesser quality product). The cast in each case, together with the previously limited availability of these titles, should mean that these new releases are ‘must buys’ for fans of classic Hollywood cinema. 'The Mad Miss Manton' would seem to be a particularly good buy for UK cineastes as the only other issue of this title is part of the 'Warner Archive' series, which, though excellent, means importing from America. All titles are available from the end of October 2010 from Odeon Entertainment.